The BEST way to Collect Maintenance Dues. Zero Efforts. 100% Peace of Mind. Say Goodbye to NEFT Reconciliation Headaches. Members make NEFT payment, but do not inform the treasurer/society office or update the portal - leading to lots of suspense entries. Accounts team / Treasurer has to wait for bank statement or download the same and then enter / approve the payment entries reflecting in the bank statement - extra work and delay in issue of receipts. Bank Statement does not have the flat number, but the account number or transferee's name - makes it impossible to reconcile easily. Accounts team / Treasurer cannot publish timely and accurate Defaulter's Report impacting collections of outstandings. All these lead to a overloaded Treasurer / Accounts Team and most importantly inaccurate Accounts! Every unit (flat/villa/shop) in the complex is allocated a Unique Virtual Bank Account Number by ApnaComplex. Members doing NEFT/IMPS transfer should add this Unique Virtual Bank Account Number allocated to their flat as the beneficiary and then transfer the payment amount to this account number. ApnaComplex Collection Gateway process settles the amounts from all transfers into society bank account. Payment receipts are generated automatically by ApnaComplex and e-mailed/SMSed to the unit's members. All ledgers are updated automatically with details of amount transferred by the member. No manual intervention required by the treasurer or accounts office any time - huge time saver! Zero Efforts. 100% Peace of Mind. ApnaComplex also offers Online Payment Gateway where members can pay their Society dues using Credit Card / Debit Card / Netbanking. Does the society need to open another bank account? There is no need to open another bank account for adopting Collection Gateway. It works with your existing bank account. How does the member know the unique account number for their unit? The unqiue account number would be available on each invoice and would also be shown to the member on website. What reports are available in the system to track the payments? There are multiple reports in the system which show the payments, the settlement details and the amount pending to besettled. Should society members have to open new bank accounts? No. There is no need for any one to a new bank account. 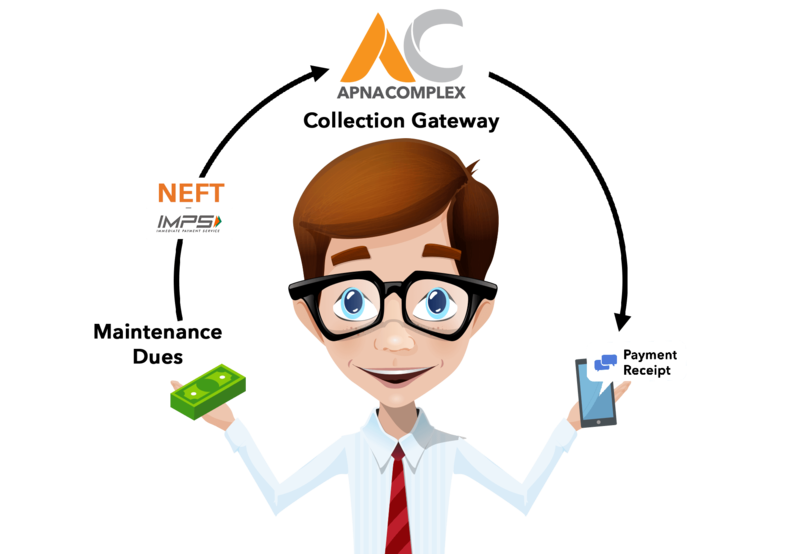 Members can transfer funds via NEFT/IMPS to the unique account number provided by ApnaComplex. Can the member make one transfer for multiple units? Each NEFT transfer can be only for one unit as the account number is tied to the flat/unit. Are there charges for this system? There are extremely nominal convinience charges for this transfer and is significantly cheaper than convinience fees on Credit / Debit Cards using Payment Gateway. Please reach out to our sales team to know the charges applicable. How is this different from Payment Gateway? When using Payment Gateway, member has to login to ApnaComplex App and then choose Credit Card / Debit Card / Netbanking to pay the dues. Member will be redirected to Payment Gateway&apos;s website where s/he can securely enter the card / bank account details to complete the transaction. When using Collection Gateway, member logs on to his/her respective Bank&apos;'s website/app and then initiates a transfer to the Unique Virtual Account Number given by ApnaComplex. As you can see, Collection Gateway can be used even by members (such as tenants who are about to move in, care taker of a flat etc.) who are not part of your society&apos;s portal on ApnaComplex. In addition there is a significant difference in convinience fees as Collection Gateway is just a regular NEFT/IMPS transaction. Who will bear the convinience charges? The charge can be borne either by the member or the society. We support multiple options. Please reach out to our sales team to know the various configurations and best option that suits the needs of your society. This is exciting. How can I get started? Great! Go ahead fill the form below and submit. We will get in touch with you. When using Payment Gateway, member has to login to ApnaComplex App and then choose Credit Card / Debit Card / Netbanking to pay the dues. Member will be redirected to Payment Gateway's website where s/he can securely enter the card / bank account details to complete the transaction. When using Collection Gateway, member logs on to his/her respective Bank''s website/app and then initiates a transfer to the Unique Virtual Account Number given by ApnaComplex. As you can see, Collection Gateway can be used even by members (such as tenants who are about to move in, care taker of a flat etc.) who are not part of your society's portal on ApnaComplex. In addition there is a significant difference in convinience fees as Collection Gateway is just a regular NEFT/IMPS transaction. Need more information? Call us at +91-80886-11229 OR fill the form below. Customers Speak, when they are delighted!